SAN FRANCISCO, Calif. /California Newswire/ — Luxury home auction consultant Guy Masters, in cooperation with Olivia Hsu Decker, the legendary luxury home specialist and co-owner of Decker Bullock Sotheby's International Realty present this unparalleled opportunity to bid on six of the finest homes in Northern California. Each non-distressed property represents the best of the California lifestyle. Ms. Decker will be donating five percent of her fees to the successful bidders' charity of choice. An $18.5 million 42-acre vineyard estate located just five minutes' drive from downtown St. Helena, Napa Valley, the world-class destination for fine wine and gourmet cuisine. Featuring an approximately 10,000 square foot main house and a poolside guest house overlooking majestic views of Spring Mountain Winery's 900+ acre vineyards and grounds which was the location of the TV series "Falcon Crest." Also for sale is Juslyn Vineyards. Established in 1998, the vineyard commercially produces an average of 28 tons/vintage of Spring Mountain District grapes including premium Cabernet Sauvignon, Merlot, and Cabernet Franc that consistently produce 90- to 96-point wines scored by Robert Parker, Jr. Listing at $11 million includes wine label, goodwill, wine club, mailing list, 3 tier and direct wholesale channels and inventory. A $5.5 million, five-bedroom, 3.5-bath home with 4 fireplaces located on Belvedere's most exclusive street enjoys mesmerizing views of the Golden Gate Bridge, San Francisco, Alcatraz, Sausalito and the Bay from this contemporary villa. A $6.995 million, seven-bedroom, 10,341 square foot estate on 2.06 acres featuring a six car garage, guests' apartment, pool with fireplace flanked by two cabanas and rose gardens. Located in the prestigious Dominican area of San Rafael. 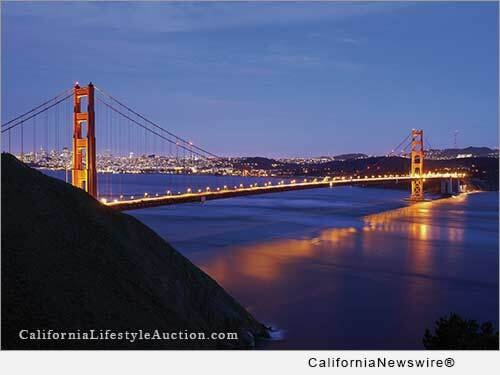 Visit http://www.CaliforniaLifestyleAuction.com for auction information or contact Guy Masters at 1-415-910-0972. To schedule a preview, please email Olivia Hsu Decker at 1-415-435-1600. Brokers with registered buyers are protected.